The Morrison Insurance was founded by Dean L. Morrison over 50 years ago. The agency was dedicated to providing professional insurance advice with a down-to-earth, personal touch. The same business philosophy holds true today with Dean's son, Chip Morrison, who has managed the agency for almost 30 years. Our in-office staff of Terri, Leah, Deven, and Cami work together to provide the exceptional customer service that our customers have become accustomed to. 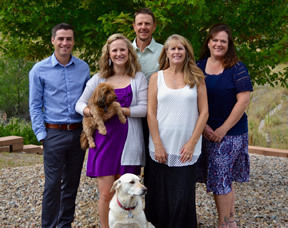 We invite you to complete an online quote, call us at 303-985-1576, or contact us at terri [at] morrinsurance [dot] com to review coverage options for car insurance, home insurance, life insurance, business insurance, renters insurance, boat insurance, and more. We provide free, no hassle and no obligation insurance quotes to help you make an informed insurance decision. Morrison Insurance strives to offer you quality insurance coverage, a high level of professional service and a long-term relationship. As independent insurance agents in Lakewood, we’ll research rates and coverage from top insurance companies to find the best insurance rates and insurance plans for you. We do the insurance shopping and comparing for you to save you time and money!